Shares of Starbucks (NASDAQ:SBUX) have felt some serious pain over the past couple of trading weeks. While the intermediate- to longer-term charts are now in bearish territory as a result, in the near term and into the July earnings report, SBUX stock now sets up as a bounce candidate. Both to my direct clients as well as in this here column, I always like to be very clear to differentiate between “trade” and more intermediate to longer-term investment ideas. Any successful market participant will tell you that it is rarely a good idea to turn trades into investments and vice versa. Keeping one’s time-frame clear on any given trade is key to success in this business. That, however, does not mean we don’t need to look at longer-term charts if considering a pure short-term trade. In fact that is precisely where traders gain an edge — by having that perspective in multiple time frames. On the multiyear monthly chart, we see that coming out of the 2008/2009 financial crisis, SBUX stock rose significantly along with the broader stock market. By the fall of 2015, however, the stock began to stall and from there trotted sideways for a prolonged period, frustrating the trend-following crowd or anyone else looking for a more sustainable directional move. This sideways shuffle finally ended in June 2018 when SBUX stock snapped its yellow 50-month moving average and thus also broke out of the consolidation phase. From this angle, the stock now looks broken with plenty further downside left through a multimonth/quarter lens. On the daily chart, we see that the stock developed a wedge-like pattern in the first half of 2018, which in the second half of June significantly resolved to the downside. Again, this price action is not good for the bulls for the time being, yet it could provide an opportunity for traders in the short term through the lens of momentum analysis. At the bottom of the chart we see that the daily MACD momentum oscillator is now dramatically oversold — it is in fact at record oversold levels, as measured by this oscillator. While this alone does not guarantee the stock will not slide further in the short term, it does make it unlikely that the stock will continue to slide at this recent rate and in fact might bounce somewhat. Starbucks is scheduled to release its next batch of earnings on July 26, and this has me eyeing a trade here to buy SBUX stock around the $49 area for a bounce trade up toward $51 before this earnings report. While the stock could certainly bounce more after earnings, for the purposes of this trade I want to be back out of the trade before the earnings report hits. A stop loss on a daily closing basis can be set at $47.50. 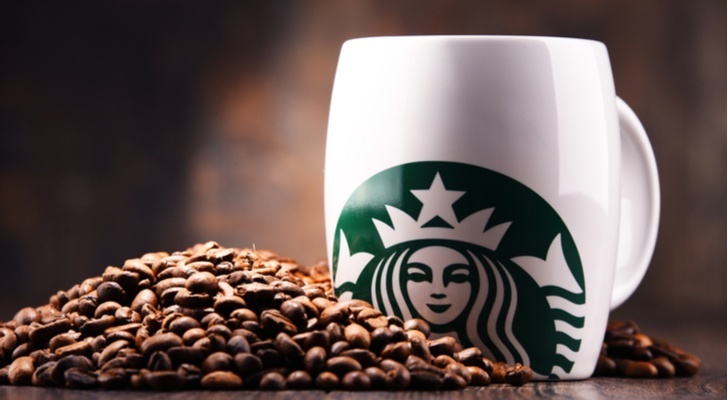 Article printed from InvestorPlace Media, https://investorplace.com/2018/07/trade-of-the-day-starbucks-stock-sets-up-for-a-bounce-into-earnings/.